Allow me to begin with an explanation of the differences between the 3 branches of Zelda II movies. With the healer glitch, Link is supposed to exit outside the healer's house, but instead he exits into Glitch Town. With the recently discovered encounter glitch, Link is supposed to exit to the overworld tile from which he entered, but instead he exits on the opposite side. With the fairy glitch, Link is supposed to exit to the room above, but instead he exits to the room below or to the right (or elsewhere). When we walk on the ceiling, we exit to the right like normal, just from a higher Y-axis position. The game correctly exits into the screen that is to the right. A random battle occurs before reaching the encounter tile. 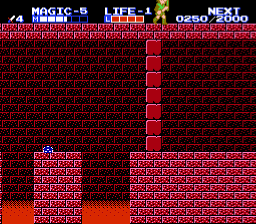 After reaching the exit of the random battle, the game correctly exits into the next tile onto which Link was stepping. We never trigger the encounter tile entry. Fairying through a door is a basic feature of the game and doesn't warp anywhere. Up+A is a standard game restart sequence that resets everything to a fresh state except for Link's levels. It has nothing to do with unintended exits. The "warp glitch" branch, which is just "any%" on speedrun.com, allows both the scroll-lock and hyperspeed glitches. These extremely gamebreaking glitches transform the game into an unrecognizable mess. Every exit becomes broken and Link can bypass the Great Palace barrier without placing any crystals, and so the game ends after 5 minutes of madness. Now, let's talk about the specific differences between this movie and the warpless movie. This movie ends 25056 frames earlier than the warpless movie. For illustrative purposes, this chart helps visualize where the movies significantly differ. 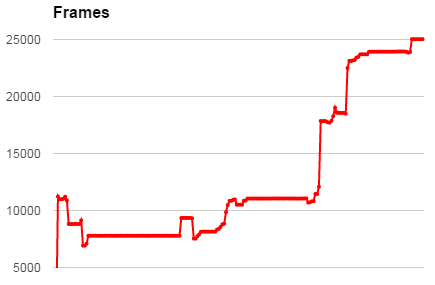 The chart shows a classic rise-fall-rise story like Cinderella, with an especially powerful climactic ending. At this point I am going to point out all of the main differences between the two versions. This information will spoil what happens in the movie, and so you may wish to stop and view the movie first. You can also check my spreadsheet for complete details about screen differences. Immediately goes to Rauru and performs the healer glitch. Takes the backdoor route to Death Mountain instead of through Saria. Uses the encounter glitch on the bridge. Obtains experience in a different way in Death Mountain. Restarts immediately after getting the hammer (skips the Magic Container). Gets the statue from the cave. Goes to Ruto and learns Jump. Reverses Downstab and Fairy order in Mido. Gets the Magic Container from the cave before Parapa. This decision came after a long internal debate about whether to go 2-2-1 or 1-3-1 in Death Mountain because of how much time it would take to finish Parapa with the necessary levels. After much research, I found that the correct answer was neither, and everything I had done was a waste of time, because I would need 6 Magic Containers to get Reflect later. Makes no changes in the Island Palace, but I spent a long time looking into using the fairy glitch here. Unfortunately, it isn't possible to make it work with the long-term planning of the movie. I need the experience to get to Magic-5 by the end of the palace. Takes Magic Container in the Maze before going to Darunia. Skips all 4 traps at Darunia. Takes all of the shortcuts through the Maze via the encounter glitch. Uses a completely new method to get through the Maze Palace because I have only 6 Magic Containers instead of 7. Minor changes in the Sea Palace. Longer, more entertaining Gooma fight because I have Attack-3 instead of 5. Link never touches the ground. Skips the 3 rock geru traps. Completely skips Kasuto and the Magic Container. Skips the bridge to the Rock Palace. Gets a magic jar in the Rock Palace in a slithery manner. Uses the fairy glitch to skip 2 screens. Wicked awesome whirlwind to kill the paltamu. Fights Rebonack II at Attack-4 instead of 6. A crown jewel, silky smooth boss battle against Volvagia at Attack-4 instead of 6. Skips Thunder in Old Kasuto. Skips 2 traps before the Valley of Death and the 3 traps within it. Uses two consecutive fairy glitches to skip Thunderbird. Dark Link fights are always different in different versions. Mothrayas: Being unburdened by the restriction of skips and tricks other than breaking the game with L+R movement, this run brings a creative new route compared to the "warpless" branch. Viewer response seems to agree. Accepting as a new standard branch, with the former branchless movie relabeled to "warpless". feos: The other run will be up soon, claiming this one meanwhile.